As parents, we all want some assurance that what we are doing to help our children is working. So I totally understand the question. I answer this way because there is a huge difference between what the caregiver might perceive and what the child feels. My son will often have a great day at school and then meltdown in the late afternoon. I myself have trouble determining when my medication has worn off – but I do know that it doesn’t feel good. 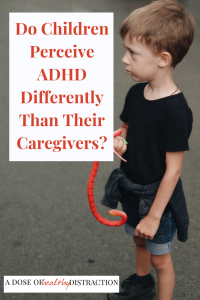 I recently had a conversation with Dr. Manisha Madhoo, Vice President of Global Medical Affairs, Neuroscience at Shire about a study that focused on the burden of ADHD as perceived by both children and their caregivers. My main questions for her were around whether or not the people around these children can tell how hard it is to live with ADHD. She explained to me that most patients perceive the burden of ADHD to be higher than their caregivers do. This study, titled “The Burden of Attention-Deficit/Hyperactivity Disorder in Children and Adolescents as Perceived by Caregivers and the Diagnosed Individual,” was done with children. Let that sink in for a hot minute. Obviously, if it’s hard for me as an adult it must be even more difficult for a child. The bottom line is this: Improved communication between you and your child is just as important as medication and therapies. When stimulants work the change can be immediate and gratifying. But it sometimes takes a bit of tweaking to find what works. Families and patients get frustrated in the process. My experience with stimulants is personal, and also applies to various family members. There are also side effects. You can find an exhaustive list of these side effects by doing a simple Google search. The controversy over ADHD stimulant medications still baffles me because self-medicating is worse for your overall health in the long term. Many untreated adults and adolescents with ADHD self-medicate. I will elaborate on this topic in later posts. With that said, stimulant medication is not a panacea. According to Dr. Madhoo, results from this study found that children with ADHD still feel the pressure of life with ADHD, even with the medication. From a teacher or parent’s perspective the child is doing well. But the child still feels pressure to conform to school expectations that are not designed for their learning style. ADHD children are almost always aware that they are “different” from their peers and many have problems with socializing and making friends. This problem is compounded by the fact that most medications only last 4-8 hours. Personally, I know that when my medication wears off I can just barely hold it together in the evening. I’m an adult, so I can attempt to communicate this to my family. Again, a child may not be able to articulate what is going on and could appear to be acting out or behaving defiantly. As a caregiver AND a patient, I have a unique perspective into the way ADHD affects our relationships. I have always known that my son, and children with similar neurological profiles, do not choose to be difficult. Parents of kids with ADHD and other complex diagnoses would be wise to remember this because after the medication wears off it becomes nearly impossible to function. And even if children have the medication they have worked tremendously hard to get through the day. Interestingly, the caregivers whose children were on long-acting medication reported BETTER relationships and communication with their children. If that’s not an argument for longer-lasting medication I don’t know what is. It’s hard to tell if the medication is working in your child. It’s also hard to tell if they are experiencing adverse side effects. Even if the medication is working, your child still has significant hurdles to overcome. As parents, we sometimes underestimate how much ADHD affects our children’s social/emotional functioning. Track your observations of your child’s behavior for a few weeks. Make notes about what is going on emotionally and behaviorally at different times of day. Take notice of what time your interactions become more difficult, or your child seems to be showing more symptoms. After a meltdown try to get them to talk about it. ASK – ask your child if they know when their medicine isn’t working. You will be surprised what kind of information you can get from children as young as six years old. Improved communication between you and your child is just as important as medication and therapies. Click here for more information about research at Shire.